Humanima CIC - Working with Animals to Help People ~ A West Midlands Based Social Enterprise Providing Counselling & Animal Assisted Therapy Courses - Plan, Propose, Prepare, Prevent! Home/Animal Assisted Psychotherapy, Animal Assisted Therapy, Case study, Counselling, Good Practice, Psychotherapy, Wolverhampton/Plan, Propose, Prepare, Prevent! there is a Campaign to End Loneliness. PAT dogs and visitation schemes help prevent and reduce loneliness within such institutions and for those who have little or no family, or family who are far away this can mean the difference between contented and fulfilling older ageing and depression and distress. great opportunity for older to people to engage with one another (I have seen this first hand on a PAT visit and it is beyond amazing!) it is a chance to increase intergenerational interaction – so interaction between people of different ages and generations. As we know, dogs (and other animals) act as social catalysts (McNicholas & Collis, 2010) and so adding them into the equation where isolation and loneliness are problems can only help alleviate such challenges. In order for such ‘antidotes’ to be applied though, the readiness and ease of setting in motion such interventions needs to be significantly greater and smoother! My impression is that in America, they are willing to take risks more readily based on ‘gut instincts’. They trust their instincts and are willing to try something out because so much points to its success. 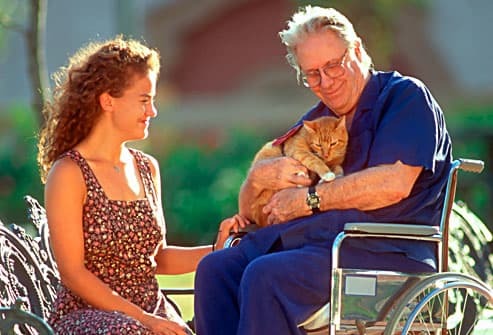 However, on our side of the Pond, we are sorely lagging behind despite the valiant efforts of organisations such as PAT and the Society for Companion Animal Studies (SCAS) to demonstrate the benefits and gains that could be made from accepting, what is now, an evidence based approach. Yes more research is needed, but it’s very difficult to do the research when you can’t even implement a project to collate the research and statistics! When I ran the first “Animal Assisted Therapy in Counselling” course back in June, one of the areas I covered was outcome measurement. But in order to measure any outcomes we need to have a project to get outcomes for! How do we do that? To start with, you do need to ensure you have the background, knowledge, support, SAFETY NET and of course insurance in place. Knowledge and information cost nothing and it costs nothing to ask questions. If you are thinking of starting a project, and you want it to succeed, the key and the magic will be in the making – the planning, proposing, preparation and prevention. PLAN – your project. What idea is it you have? Does it have legs (excuse the pun…!) If you’re not sure, ask around. Technology now allows us to explore ideas by creating things like questionnaires and polls to test the waters and see if people indeed would be interested in such a project. A key question is WHY are they interested in it? This will tell you how feasible the project is and why you should be doing it in the first place. No point in doing it if nobody has any need for it. However, need/ want nowadays are interchangeable in the material world. Explore it. PROPOSE – Who will you be proposing the project to? Who you propose it to, should have been consulted when you were planning the project. At the end of the day, they may end up being your customers! Also, think outside of the box – if you offered it to a residential home and they are interested they which other services linked to residential services might be interested in your project? Don’t forget, you are only PROPOSING an idea at this stage so you need to be flexible – the idea for the project may adapt and/ or change shape. PREPARE – You can never be too prepared. Cover all your bases. Is everything in place? If, for example, your project involves feeding participants, it’s better to have too much than too little. Have contingency plans in place because s*!t happens! Best to err on the side of caution and prepare for a worst case scenario than a best case scenario. All the while you are working through the “4 P’s” you still need to be gathering information and knowledge as you will find that time will slip through your fingers like melting butter! PREVENT – This is the key point that links into the start of this blog. You don’t want something to go wrong at all so the best way is to prevent it from happening in the first place. Don’t assume that participants are not scared of dogs, if it’s an AAT programme with dogs, and they’ve shown interest – on the first course, whilst I did ask people to tell me if they had a phobia and nobody did, there was one lady who was a little uncomfortable. Thankfully nothing happened, but I did have Flossie’s crate ready JUST-IN-CASE and it would have been easy to separate her from the group had the need arisen. If you have these 4 elements in place before approaching and whilst approaching anyone with a project or idea, the process of your project being accepted should be a LOT smoother and hopefully quicker. Don’t forget, if its an AAT project and it is accepted, what you do will represent the field so we want it to go well! Please don’t take chances and consult where possible if you’re unsure!